When we used to use an object for something else, it was called, "multi-purpose," or old technology. A really old thing became an antique or vintage object and may have added-value, if it were rare. At the moment, we try and recycle or downcycle many materials (such as electronics) that are environmentally distasteful or downright toxic. After the invention of farming, we usefully recycled some less profitable crops by green manuring, often using leguminous clovers, rye and the like. The future? Well we may be able to rely on more automatic disposal and recycling technology if our science keeps developing apace. When an ancient wanted a new axe, he went and sharpened the old one. When the head wore out, he recycled the same handle and bought or exchanged for a nice new one. In such times recycling an animal was about our limit, with skins and horn to use for clothing or tools, as well as the meat content. 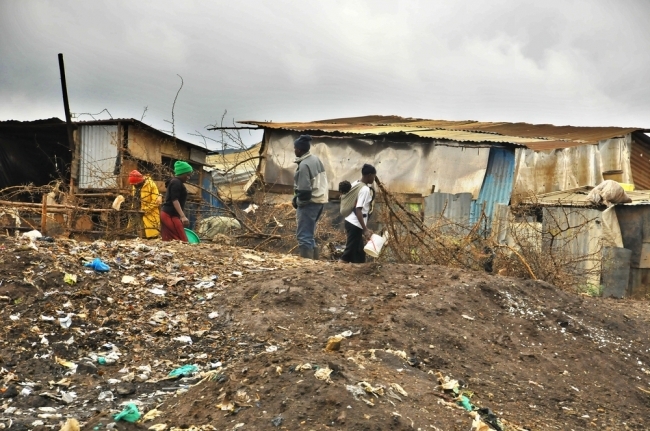 Little was wasted as value was found in most objects, just as in these Asian or African (Nairobi) rubbish heaps nowadays, where people survive on their version of recycling. We deal in recycling now with huge amounts of almost unknown materials, some of which are simply turned around and some that find their way into awkward situations such as mercury. Being dumped from so many small batteries, metals such as mercury (along with lithium and cadmium) can't be tracked into our environment. Fish have long been avoided as food in some regions because too much mercury found its way from industry into the local ecosystem. The lesson there was learnt the hard way with the tragic build up of methyl mercury in the marine life of Minamata Bay in Japan. Now we can realise potential profit from locating these metals and selling them back to their original polluters. Even better the schemes whereby cars and other industrial products are sold back to the manufacturer for recycling pose an even more efficient solution to the problem of relocating lost materials in the industrial environment. Glass is a well-cycled product, with even the bottles being recycled in early history. The latest mode is to downcycle and incorporate excess amounts of green glass in road building materials. RMC materials has received permission to use their Glasphalt product after experimenting with resurfacing bits of UK motorways. The saving in the downcycling of course is in the energy required to make glass, and of course many other materials especially the metals. We just need to recycle all that rubber from tyres now, although many small-scale ideas have been and still are tried. On another organic area, wood recycling (of whole forests) has been the trend ever since we realised there would be no wood! Scandinavian enterprise quickly converted use all to replanting everything we had harvested, so that in years to come, people could re-harvest the same crop of timber. Unfortunately oaks and many others have a complaint, as they never achieve their full dominant place in the community and the ecosystem unless they are given a few hundred years. Who is prepared to wait that long for a profit motive. Plastics are organic all right. We need to use wood perhaps to make them in future, but organic chemistry has evolved far enough to dispose of the fossil raw materials (oil, coal and gas) soon. Incineration (burning) is unthinkable nowadays largely because of global warming and toxicity warnings, but this doesn't stop the wholesale "recycling" of our biologically- diverse forests by commercial interests keen on profits from oil palm. The recycling of thermoplastics luckily is much simpler but the further development of biodegradables is good news for both us and the bacteria. Let's hope even more materials will be recycled in the near future. Perhaps old (and newly-unearthed) politicians could be found a suitable home in the deep dark reaches of some recycling plant.